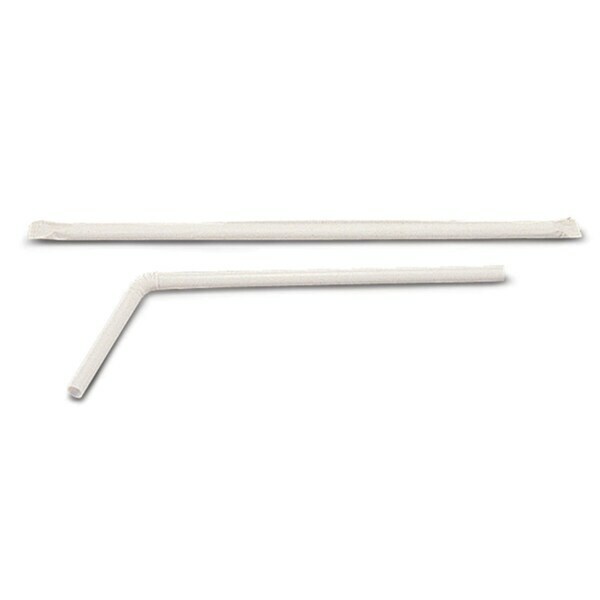 Single wrapped straws. These arrived nicely wrapped in smaller boxes. We use them every day for drinking or stirring. They stay sanitary because each is wrapped individually. Nice deal! Will buy again. Institutional quality straws come in flexible style, individually wrapped or wrapped bulk packaging. We were sent home from the hospital with some straws and were running low. We ordered the flexible drinking straws as advertised. They arrived in less than a week. The quality was better than expected, in fact, they were of better quality than those issued by the hospital.. They were individually wrapped and had a flexible portion that made them useful to the bedridden as well as children to prevent spills and accidents. We were always scurrying around looking for a straw, Now we have a great product available when we need it. For some reason or another, food service stores have stopped stocking these " individually wrapped FLEXIBLE straws". I did a Google search and found these at overstock.com. The price was right and shipping very reasonable. I ordered these on Sunday afternoon and they were on my doorstep Tuesday afternoon. Can't beat that! I will be looking for other bargains on overstock.com on a daily basis.... Thanks! This is the way to buy drinking straws. We go through them fast around here. Buy in Bulk, they are great quality, and we always have straws. I bought several boxes some time back. I rinse and reuse them so that I save money while doing better for the environment. The flexible piece makes it easier for my young ones to drink without dribbling and spilling. Medline's products are always reliable and the prices are much better here on Overstock than anywhere else. Eventually, when I need more, I'll be coming right back here and hoping they're still available. These straws are inexpensive but of good quality. They can be flexed repeatedly without cracking and the walls are sturdy, not thin. Even more amazing was the speed at which I received the shipment. It's everything I wanted! Thanks, great product, shipped quickly. product is fantastic, shipping time was even better, received in under two weeks. Thank you - just what I was looking for! My husband had been sick and really liked the hospital straws - nothing at the stores was quite right.